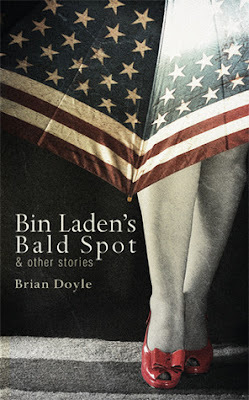 Bin Laden’s Bald Spot: & Other Stories is a wild collection of wild voices unreeling wild tales: His Murderous Idiocy’s barber talking about life in the Tora Bora caves, Joe Kennedy trying to explain his selfish and haunted life to a bartender, Cardinal Bernard Law’s kidnappers explaining how right and necessary it was to “nick a Prince of the Church and put the slime to work to expiate his crimes,” and much, tumultuously, else. I am here to tell you that Osama has a bald spot the size of a baby’s fist on the back of his head, shaped exactly like Iceland, complete with the Vestfjarda Peninsula to the west. He does not like to speak of this and indeed we have only spoken of it once, when I said to him, sir, you have a bald spot back here shaped just like Iceland, and he said I do not, and I said, yes sir, you do, it is the size of my fist and even has the little peninsula to the west, just, like Iceland, and he said I do not have a bald spot, and I said, well sir, actually yes you do, sir, it’s a big honking thing, too, you could land a helicopter on it, so maybe we should be discussing a hair weave? Sir? Sir? Brian Doyle is the editor of Portland Magazine at the University of Portland, “the finest spiritual magazine in America,” says Annie Dillard. He is also the author of thirteen books, among them the “sprawling serpentine sinuous riverine” Oregon novel Mink River, a finalist for the 2011 Oregon Book Award.